How to set priorities and succeed. You will have daily priorities such as taking the kids to school, and you should also have daily goal specific actions – these all need to be prioritized into one seamless set of action items to make sure your day-to-day life doesn’t take precedence over your goals and vice versa. Priority 1: Must Do – these goals or activities must be achieved if you are to consider yourself ‘successful’. These are your highest priority goals or activities. Priority 2: Should Do – these goals or activities should be achieved (but it is not essential) to consider yourself ‘successful’. Priority 3: Nice to Do – self explanatory. You may prefer the commonly used “High | Medium | Low priority” terminology. Ranking system - where you number all tasks in the order that you need to do them, from 1 being most important (do this one first) to however many action items there are on your list. 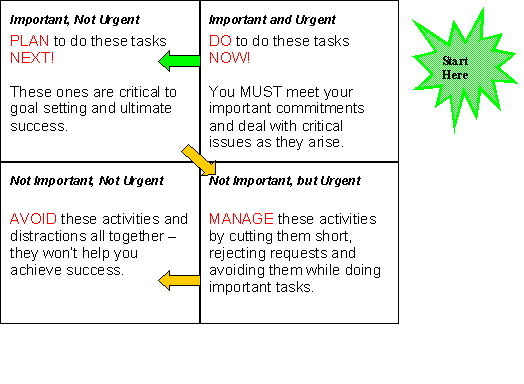 Urgent | Important activity matrix Another popular way of prioritising action items is the Urgent | Important activity matrix originally developed by time and organisational management guru Stephen Covey. 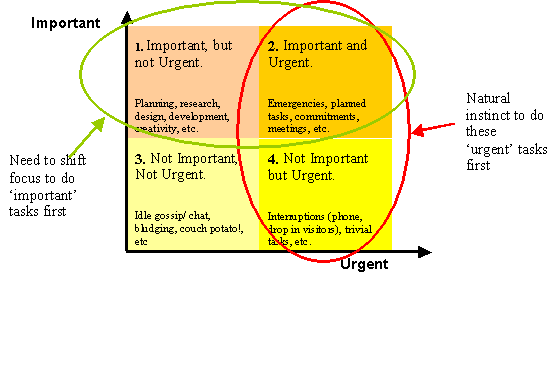 This matrix is based on all tasks being assigned a level of ‘urgency’ and ‘importance’ as illustrated below. Human nature means that we instinctively act on tasks that are ‘urgent’, whether these tasks are important or not. That’s OK for the tasks that are also important, but the other ones are not necessarily the best use of your time and effort. This matrix can also be used to explain why taking action on goals sometimes gets into trouble. Goals are typically derived from dreams and desires, which by their very nature are not ‘urgent’. Goals are however VERY important and their enabling actions need to be elevated in priority over tasks that are not really important. Most importantly, find that suits you set priorities – prioritising tasks is the key to time management and organisation and is essential if you have any hope of achieving your goals. And don't forget to document your set priorities in your action plan.